For nearly one and a half centuries, the cause of the most notorious fire in U.S. history has been a source of “heated” controversy. Some researchers suggest that a disintegrating comet ignited the blaze. But the electrical theorists say that evidence most often ignored offers the best clues. “With the heat increased the wind, which came howling across the prairie, until at last there arose a perfect hurricane. Mighty flakes of fire, hot cinders, black, stifling smoke, were driven fiercely at the people, and amid the terrible excitement hundreds of them had their very clothes burned off their backs, as they stood there watching with tearful eyes the going down of so many houses”. -- James Goodsell's History of the Great Chicago Fire, October 8, 9, and 10, Published 1871 by J.H. and C.M. Goodsell. Sunday evening, October 8, 1871 marked the beginning of one of the most devastating fires in U.S. history. Legend has it that “The Great Chicago Fire” resulted from an agitated cow kicking over a lantern in “Mrs O’Leary’s barn”. The dry leaves and parched wood of Illinois in early autumn were the perfect kindling for a wildfire, and the fire spread with extraordinary rapidity, consuming homes and buildings, leaping from rooftop to rooftop with the speed of a locomotive. Between October 8 and 10, an estimated 350 people perished. The fire destroyed the homes of up to one-third of the city's population, about 1,600 stores, 60 factories, and 28 public buildings. Four square miles of the city burned to the ground. 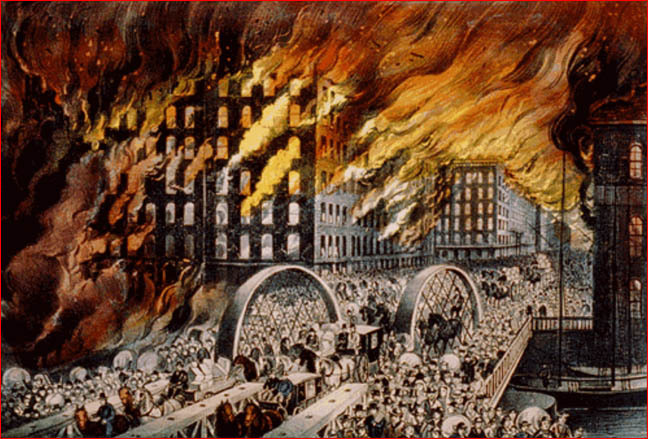 Contrary to popular folklore, the Chicago fire is not the worst in U.S. history. It was not even the worst to occur on October 8 that year. The same evening—in fact, at the same time, about 9:30—a fierce wildfire struck in Peshtigo, Wisconsin, over 200 miles to the north of Chicago, destroying the town and a dozen other villages. Estimates of those killed range upward from 1200 to 2500 in a single night. It was not the Chicago fire but the simultaneous “Peshtigo Fire” that was the deadliest in U.S. history. And there is more. On the same evening, across Lake Michigan, another fire also wreaked havoc. Though smaller fires had been burning for some time—not unusual under the reported conditions—the most intense outburst appears to have erupted simultaneously with the Chicago and Peshtigo fires. The blaze is said to have then burned for over a month, consuming over 2,000,000 acres and killing at least 200. Concerning the Michigan outburst, it is reported that numerous fires endangered towns across the state. The city of Holland was destroyed by fire and in Lansing flames threatened the agricultural college. In Thumb, farmers fled an inferno that some newspapers dubbed, "The Fiery Fiend." Reports say that fires threatened Muskegon, South Haven, Grand Rapids, Wayland, reaching the outskirts of Big Rapids. A steamship passing the Manitou Islands reported they were on fire. There can be no doubt that weather conditions at the time favored wildfires. But never before, and never since, has the U.S. seen such wildly destructive simultaneous conflagrations. This “coincidence”, combined with many unusual phenomena reported by eyewitnesses, has led some to conclude that an extraordinary force, one not of the earth, was a more likely “arson” than either a misbehaving cow or a regional drought. In 1883, Ignatius Donnelly, author of Ragnarok: the Rain of Fire and Gravel, suggested that in early historic times our Earth suffered great catastrophes from cometary intruders. To this claim he added: “There is reason to believe that the present generation has passed through the gaseous prolongation of a comet's tail, and that hundreds of human beings lost their lives”. He was referring to the conflagration of 1871. Is there plausible evidence that a comet may have caused the Chicago fire and its regional counterparts? In 1985, Mel Waskin, who had earlier discovered Donnelly’s work, published a book, Mrs. O’Leary’s Comet, suggesting that a comet did indeed spark the October 8th fires. More recently, Robert Wood, a physicist and aeronautical engineer formerly with Douglas Aircraft and McDonnell Douglas, gained attention from the Discovery Channel and other media for proposing the same idea. The proponents of the cometary explanation cite many fascinating details confirmed by eye witness reports: the descent of fire from the heavens, a great “tornado” of fire rushing across the landscape and tearing buildings from their foundations, descending balls of fire, a rain of red dust, great explosions of wind accompanied by blasts of thunder, buildings exploding into flame where no fire was burning, and a good deal more. Some of the parallels with the later Tunguska event are impossible to miss. It seems that the records of the conflagration hold many clues that are almost never mentioned in scientific discussion of the Chicago fire. Over time the clues have virtually disappeared. They have disappeared because they are not meaningful to minds conditioned by popular ideas about how the “Chicago fire” started and what is “scientifically” possible. Within these habits of perception, the most important evidence will often go unnoticed or unremembered.